The barcode was first theorized at Drexel University (1948). After hearing requests from local supermarket shoppers to create a scannable way to checkout at a quicker pace. Bernard Silver and Norman Joseph kicked off the beginnings of the U.P.C. 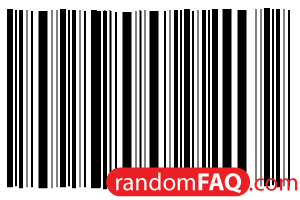 (Universal Product Code) as we know it today. In the beginning, ideas included a bulls-eye shaped product code in ultraviolet ink. The first supermarket scanner wasn't installed until the 1970s in Ohio. The pack of Wrigley's Juicy Fruit scanned first was arbitrarily chosen from the cart. This original 10-pack of gum is now on display at the Smithsonian museum.